Broom has led the market for decades in Aft Cabin Cruisers, providing many benefits to our customers, of which we are extremely proud. The main advantage of owning an Aft Cabin craft is that it makes full use of the spacious full beam width, providing a large cabin with walk around 'island berth' and en-suite facilities, along with built in, contemporary, modern furniture.. Another significant advantage of Aft Cabin Cruisers is that they encompass an upper helm position. From this position the helmsman has excellent visibility with a full all round deck view and easy access to mooring cleats. Also, from this position it is re-assuring to know that the crew can be located anywhere whilst on deck. 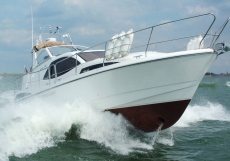 Aft Cabin Cruisers Broom has led the market for decades in Aft Cabin Cruisers, providing many benefits to our customers, of which we are extremely proud. The main advantage of owning an Aft Cabin craft is that it makes full use of the spacious full beam width, providing a large cabin with walk around 'island berth' and en-suite facilities, along with built in, contemporary, modern furniture.. Another significant advantage of Aft Cabin Cruisers is that they encompass an upper helm position. From this position the helmsman has excellent visibility with a full all round deck view and easy access to mooring cleats. Also, from this position it is re-assuring to know that the crew can be located anywhere whilst on deck. The History of Broom Boats A history of quality and innovation For more than 110 years, the Broom name has been synonymous with luxury boating. From the earliest days of hand-crafted wooden sailing ships to the sophisticated cruisers of today, a tradition of engineering excellence and quality of manufacture runs through every boat we build. Broom was at the forefront in introducing motorised cruising, building the holiday hire business and developing the first fibreglass boats. Our boats introduced many to the joys of being on the water: from the simple pleasures of boating on the Norfolk Broads to the luxury of cruising at sea for the rich and famous. Throughout our history we have led in the development of new ideas to make boating more enjoyable. The new Broom 430 debuted at Boot Dusseldorf on 18th January 2014. It is built on one of our most popular semi-displacement hulls which has a proven track record as a terrific sea boat whilst being equally at home on Europe’s inland waterways. The interior builds on Broom's reputation for excellence, practicality and handcraftsmanship heralding a new era of quality and innovation. The detailing features an unrivalled attention to detail with the latest finishes and technology to make this the best Broom yet. We offer enormous scope for customisation to build your ultimate Broom around you. All packaged in a solid, assured and versatile hull. The Broom 30 Coupe HT offers comprehensive access of Europe's waterways which can sometimes be restricted by low bridges and height restrictions. The 30HT is available in a hardtop offering extra protection against the elements, with a fully retractable, sliding canvas roof and bonded windscreen with opening inserts. The softtop features a folding windscreen and arch assembly, offering comprehensive access of Europe's waterways which can sometimes be restricted by low bridges and height restrictions. The contemporary interior is light and airy, offering all on one level living. It features all of the quality of finish, craftsmanship and comfort you have come to expect from a Broom boat, packaged in a practical, compact river cruiser. With its folding windscreen and arch assembly, the Broom 30 Coupe offers comprehensive access of Europe's waterways which can sometimes be restricted by low bridges and height restrictions. With a minimum air draught of just 2.2m it offers great accessibility for such a spacious boat. New for 2014, the optional hardtop version offers extra protection against the elements. It features a fully retractable, sliding canvas roof and bonded windscreen with opening inserts. The contemporary interior is light and airy, offering all on one level living. It features all of the quality of finish, craftsmanship and comfort you have come to expect from a Broom boat, packaged in a practical, compact river cruiser.